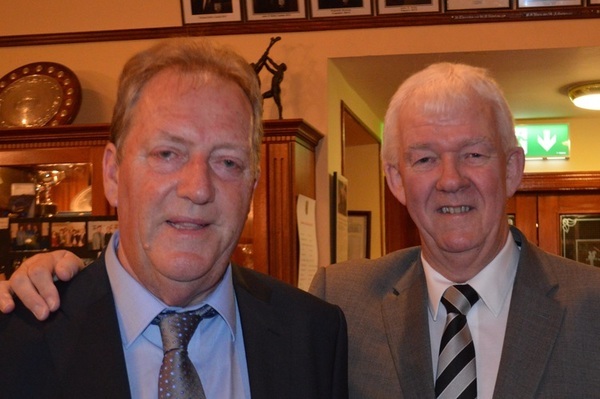 In club professional John Burns, Mullingar has had a great servant for more than 41 years and as he approaches his 65th birthday later this year, the inevitable is about to occur. Just as Bobby Browne and David Kinsella are synonymous with Laytown and Bettystown and Castle, John is Mr Mullingar and will be greatly missed when he retires later this year. Naturally, the club recently held a hugely successful testimonial day for their long-serving PGA professional in recognition of his loyal service to the club. John Burns, pictured with Michael McCumiskey, Secretary of the PGA Irish Region. He was bestowed with honorary life membership to the acclaim of the massive gathering present. Indeed, he is almost certainly one of the longest serving PGA professionals in the country. He served his apprenticeship in Killarney under Tony Coveney and having graduated went to Hermitage, before being appointed in Mullingar on Easter Monday 1974. Among those present among a large number of friends and guests were his brother Michael Burns, now an R&A selector, PGA officer Peadar McPartland and Michael McCumiskey, Secretary of the Irish Region of the PGA, as well as other local dignitaries. Given the worldwide fame he secured for the James Braid track by hosting a charity day there in 2012, it's no surprise to hear that One Direction star Niall Horan has been handed Honorary Life Membership of Mullingar Golf Club in his home town.